Posted on December 16, 2013 by Mark Pajor. It may be difficult to imagine now, as winter approaches and construction continues on the ECE building, but before long there will be a garden to welcome students to ECE’s new home. This garden will be composed primarily of native plants and others that are adaptable to the region, so that it will be able to sustain itself without an irrigation system. In order to better understand how the garden will contribute to the building experience, we spoke with Marisa Dittman, a landscape architect with SmithGroupJJR, who has been involved with the project since the design development stage. The prudent use of plants that do not require an irrigation system means the garden will bear no financial or energy-using burden on the building. Beyond that, the garden is actually beneficial to the building for purposes of stormwater collection. Dittman said, “It’s collecting storm water in the landscape bed, so it’s serving its purpose from a stormwater standpoint. We’re capturing some of the water with the plant material and then releasing it back into the atmosphere.” Any stormwater that cannot be captured and used by the plant material will be collected in the infiltration trench running the perimeter of the building beneath each landscape area. Aesthetically, the different faces of the building will take on individual garden styles. Particularly of note is the south side. As mentioned in previous net-zero energy blog posts, the south side of the building consists almost entirely of windows to let in the sun. This means there will be indoor-outdoor views, so special care has been taken in the style of this side of the garden, which is intended to represent a flowing stylized prairie as opposed to the formal appearance of the remaining garden spaces surrounding the building. “When you’re looking in that area you’re going to see more native grasses, shrubs, trees,” said Dittman. Students in the main south corridor will have a great view of this section of the garden. The plant material chosen for the other sides of the building were chosen to create a cohesive aesthetic experience for the ECE building and for the quad as a whole. To tie the garden to the rest of the building experience for students, the garden will be integrated with walkways and seating areas. A dry riverbed will allow limited entry into the south garden, providing students with an ideal environment to relax between classes. Seating areas will be located at each of the major building entries and on the walkways within the south and east garden areas. In the south garden, seating will be comprised of limestone outcropping that will tie into the aesthetic of the dry riverbed. The garden will be planted next year, when the building is closer to completion and the stormwater infiltration trench has been installed. Much of the plant material will be installed at a reasonable size, but in general the plant material may not aesthetically appear to fill in until after the first growing season. Posted on November 18, 2013 by Mark Pajor. 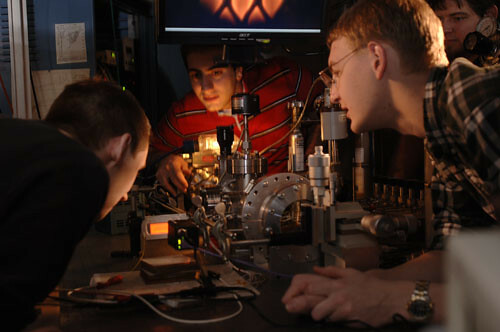 In 1950, ECE faculty established the Gaseous Electronics Laboratory, now known as the Laboratory for Optical Physics and Engineering (LOPE). The laboratory is committed to the pursuit of new and efficient sources of visible, ultraviolet, and vacuum ultraviolet radiation. Since 1962, LOPE has been located in its own building near the corner of Wright and Healey streets in Champaign. The building was not intended to last this long. On the laboratory’s current location, ECE Professor Gary Eden said, “It’s a building that, because of its age, is not well-suited for doing experiments with the very sophisticated optical equipment that we have.” The current building has several drawbacks. “The heating ventilation and air condition system was not designed to control humidity, for example, or even temperature.” In order to ensure a tightly controlled environment, then, Eden had to be creative. “If you go to the laboratory today, you’ll find that there are cleanrooms that I have had to have constructed in California, shipped here and assembled inside the building. So I have a building within a building.” In order to provide LOPE with the resources and environment it needs, the laboratory will join ECE in the new building when it opens next fall. Posted on November 12, 2013 by Mark Pajor. 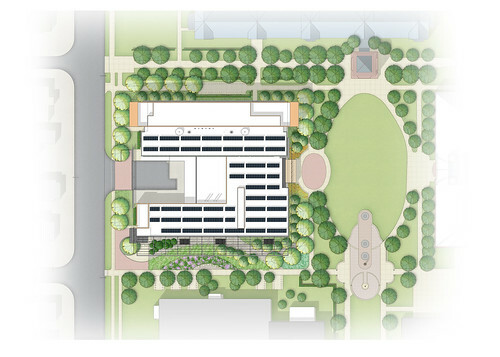 In 2008, the University of Illinois launched The Building Campaign for ECE ILLINOIS and asked alumni, faculty, staff, and friends to “do their bit” to help fund a state-of-the-art building for the ECE Department. The total project cost of $95 million is being funded in equal parts by the State of Illinois and private donors. Including state money and private donations, nearly $87 million has been secured to date. Donations have come in a wide range of sizes, with 13 donors giving $100 thousand or more. The ECE Alumni Board raised $250 thousand for the project. Sanjay Srivastava (MS ‘87) pledged $1 million, and for his donation the new senior design lab has been named the Srivastava Senior Design Lab. Frank (BSEE ’34) and Irene Low designated a $7 million estate gift to ECE, and the Frank and Irene Low Classroom Wing has been named in their memory. Fred Nearing (BSEE ’43) gave $500,000 for the building campaign, for which the Nearing Family Classroom is named. While these are examples of substantial leadership gifts, gifts of all sizes have played an important role in allowing this project to move forward. All gifts of $10,000 or more will be recognized in the building. To make a gift or learn more about how you or your company can impact this unique project, visit the donate page, or contact Molly Tracy or Martin O’Donnell at mollyt@illinois.edu or martinod@illinois.edu. Posted on October 18, 2013 by Mark Pajor. In previous blog posts, we explored the energy-saving features that will be instrumental to achieving the ECE building’s net-zero energy goal. Now, we move beyond the energy savings and explore the building’s strategy of energy creation in the form of solar power, this time speaking with Professor Philip Krein, the chair of the ECE new building committee. Atop the new building’s roof will be a photovoltaic array facing south to capture sunlight that will be converted to electricity, feeding the building grid. In order to create enough energy to reach the department’s goal, another photovoltaic array will be placed on the roof of the nearby north campus parking garage. Together, these two arrays will deliver about 1500 kW at noon on a sunny day, and approximately as much energy over the course of the year as the building and its occupants consume. A chart of the new building’s net-zero energy features. Beyond the purpose of energy creation toward the goal of reaching net-zero, the building’s photovoltaic array will also be an invaluable resource in the ECE classroom. Certain classes, like ECE 333: Green Electric Energy, will provide hands-on experience with photovoltaic technology to ECE students. These students will have the opportunity to explore green energy systems not just theoretically, but with an actual system that the department utilizes. Senior design projects and other classes in electric power and energy will also take advantage of the solar panels, with more opportunities in the future. “This is probably the largest solar array in the nation aimed at educational use,” says Krein. 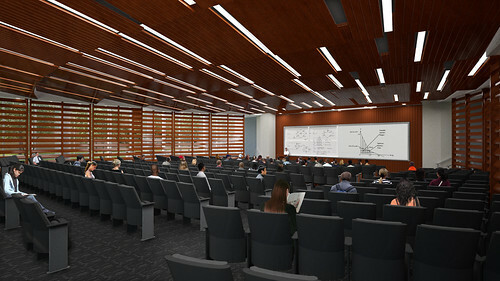 In order to reach the department’s net-zero goals and integrate the photovoltaic arrays with the classroom experience as soon as possible, the committee targets the arrays’ completion to be within a year of the building’s opening, which is planned for Fall 2014. Alongside the passive and active energy savings features discussed in previous blog posts, the solar energy creation of the photovoltaic arrays will be essential for the department to reach its ambitious net-zero goal. Posted on October 14, 2013 by Mark Pajor. As a state-of-the-art hub of research and learning on campus, the new ECE building will be home to hundreds of students and professors. As with any home, the new building’s inhabitants will benefit from a stimulating environment. The State of Illinois mandated Art in Architecture program will contribute to that stimulating environment with art around the building. “Illinois law mandates that public buildings dedicate ½% of the budget to the acquisition of art by living Illinois artists,” says George Gross, the chair of the Art Acquisition Subcommittee for the new building. 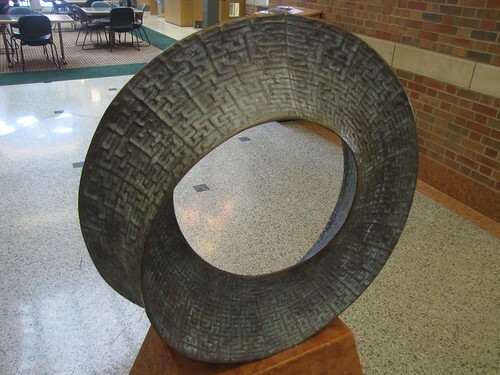 Welcoming visitors to the main lobby of the Beckman Institute, this sculpture by mathematician and sculptor Helaman Ferguson celebrates science. “The Subcommittee met and selected a subset of artists who responded to the request for proposals. These artists were asked to submit detailed plans for the specific art installations they wish to undertake,” says Gross. Once those artists have submitted their more detailed plans, the subcommittee will meet again to choose which proposals get the go-ahead. “The next meeting will be focused on the art plans for the building interior,” Gross says. These pieces of art will be showcased in prominent locations around the building, including the plaza in front of the main entrance at the east side of the building, the southwest entrance, and the atrium inside the building’s main entrance. Art in these key locations will create a welcoming, aesthetically pleasing, inspirational atmosphere for everyone who learns, teaches, and researches in ECE’s innovative new home. Posted on September 17, 2013 by Mark Pajor. Picking up from where we left off on our last “Net-zero features” post, it’s time to explore the active strategies that the new building will utilize in order to achieve the department’s net-zero goal. We continue our interview with SmithGroupJJR’s architectural designer Coty Sandberg. Two of the most effective active systems for energy savings are the chilled beams and the heat recovery chillers. Sandberg explains that chilled beams are “a high-efficiency system that utilizes chilled water to cool the spaces” throughout the building, which will function as the primary cooling strategy. This system will contribute 10% of the building’s energy savings utilizing a significant reduction in transport energy. Another incredibly effective strategy for the building is the use of heat recovery chillers with net metering. The heat recover chiller “provides condenser water to heat and reheat throughout the building while simultaneously producing chilled water as a useable byproduct,” Sandberg says. Any excess chilled water produced will be fed back into the campus chilled water network for storage or use in other buildings. The heat recover chillers make up the single most energy-efficient system in the building, contributing 23% energy savings. Other important strategies involve lighting. All of the occupied spaces use occupancy sensors, which reduce lighting when spaces are not occupied and when daylighting is sufficient. Additionally, the building conserves energy through the use of LED lighting, especially fitting for the department considering ECE Professor Emeritus Nick Holonyak’s groundbreaking invention of the first practical visible-spectrum LED. These lighting innovations make up 5% of the building’s energy savings. In addition to a few other key strategies like displacement ventilation, these active energy efficiency strategies are essential to achieve the building’s energy goals. In our next and final “Net-zero features” segment, we’ll explore the photovoltaic array that will harness solar energy, the final touch needed for the building to reach its net-zero goal. Posted on August 16, 2013 by Mark Pajor. 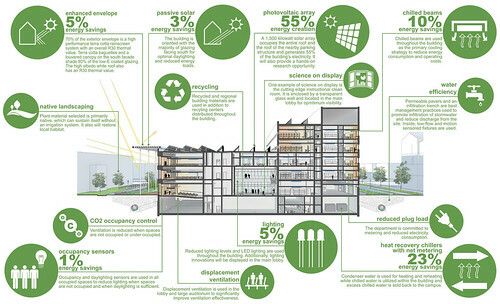 There are many different features that work into the building’s ambitious net-zero energy goal. An engineering building is bound to use a lot of energy, particularly in this case because of the building’s clean room lab. So what strategies are being used to achieve the net-zero goal? It starts with the passive solar strategies and the building’s enhanced envelope, as described by SmithGroupJJR’s architectural designer Coty Sandberg. Naturally, light and heat from the sun both help and hinder energy conservation in different ways. The new ECE building is designed to maximize the positive energy aspects of sunlight and reduce the negative ones. “Approximately 80% of the windows are shaded by the south solar canopy or by the terracotta baguettes,” Sandberg said. These elements function to let in the sun during the winter, but protect from the harsh sun in the summer. Combined with the fact that most of the building’s windows are on the south side of the building, this results in optimal daylighting and reduced energy loads. 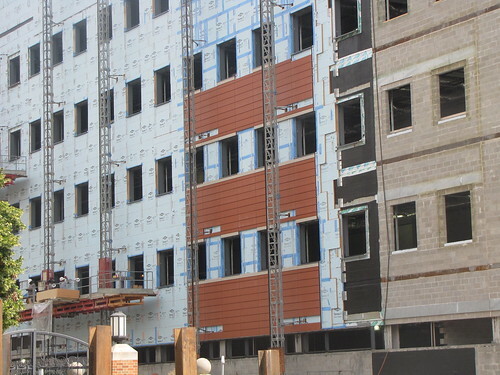 The material used for the exterior of the building is key to energy conservation. 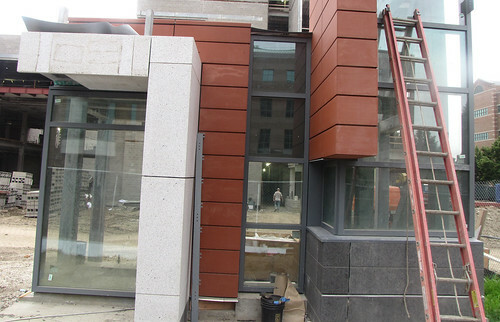 70% of the exterior is a terracotta rain screen system. Sandberg added that “The skin of this building is extremely high-performing. It has four inches of insulation to achieve this very high thermal value” – an R30 thermal value. This keeps the building safe from outside temperature fluctuations, reducing energy that would be used for heating and cooling. Those are some of the building’s passive strategies for energy conservation, and together they provide 8% energy savings – meaning that they cause the building to consume 8% less energy than the ASHRAE 90.1 baseline building, which is used to compare energy savings. Future blog posts will cover other features of the building that will contribute to energy conservation and production, which together work toward the net-zero energy goal. Posted on August 12, 2013 by Mark Pajor. As mentioned in the previous post about the mock-ups, testing systems before implementation is an invaluable planning technique. That testing process goes beyond the architectural, big-picture aspects of the building: the future building office furniture is being tested by faculty to ensure lasting quality. Providing faculty with a positive work environment enhances focus and performance. In the faculty lounge of Everitt Laboratory, ECE faculty got the chance to test out a prototype of their future offices. Because of the detailed feedback, there is one less thing to worry about when the building opens. 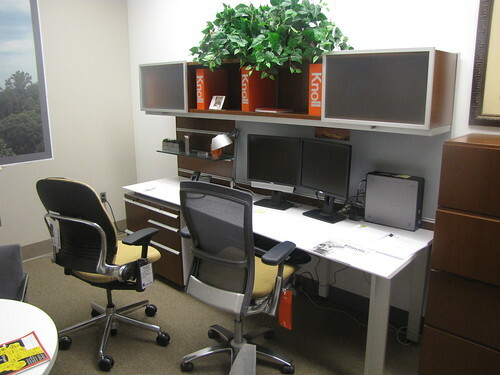 “It was a good exercise to have the mock-up available to receive input making the office arrangement even better!” Beck said. Close and careful attention even to small-picture aspects like this helps ensure a smooth transition to the new building when it is complete. Posted on July 10, 2013 by Mark Pajor. You may have noticed the small structures to the east of the new ECE building in the pictures on display in the website’s photo gallery. These are the mock-ups for the building, structures built to test the building’s features to ensure smooth construction on ECE’s future home. On a complex, energy-efficient building like this one, mock-ups are invaluable. “Mock-ups are becoming more common in big projects like these,” said Profesor Philip Krein, the chair of the ECE new building committee. “There’s two reasons for it. One is to just show that everything works together. They’ve got to put the right kind of sealants on the building, they’ve got to show that the water proofing system works right, that the air filtration system works right, that the window mounts are all leak-tight and that everything’s good.” All of these are tested on the mock-ups before being applied to the building itself. 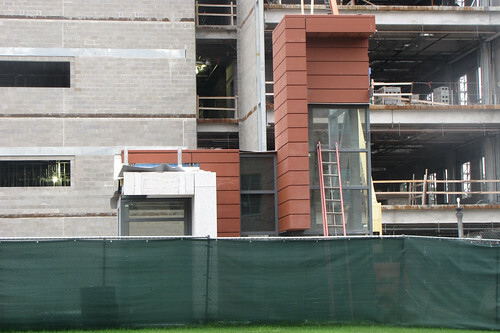 The mock-ups also give people a better idea of what the new building will look like when complete. 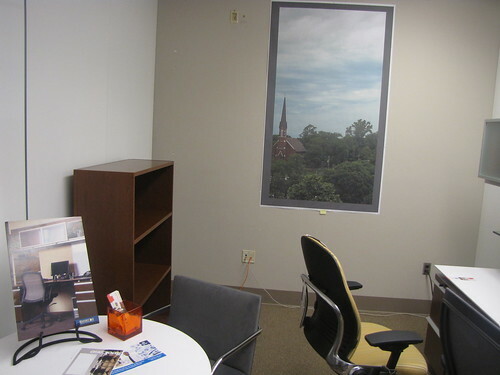 “You can see the north tower mock-up from the third-floor conference room that’s in CSL. And it’s pretty complete. So you see the stone work, you see the granite, you see the terracotta and the windows.” The terracotta and windows will help transform the look of the building from its current state to its projected one which can be seen in several places on this website, from the banner at the top of the page to the pictures in the Wallpapers section. Posted on June 17, 2013 by Mark Pajor. Dividing themselves between EE and CompE majors in a friendly fundraising competition called the Coin Wars, ECE students did their bit for the new building campaign this past semester. 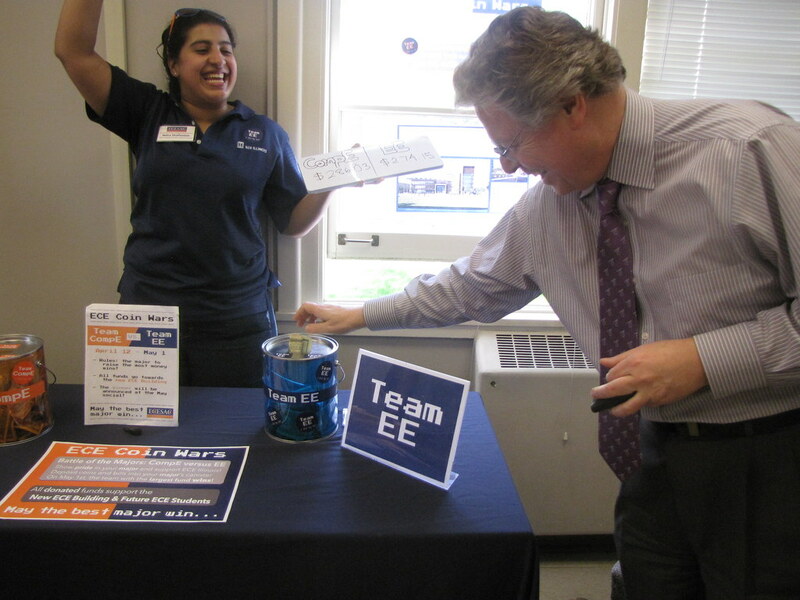 The Coin Wars were organized by the ECE Student Advancement Committee (SAC) to directly engage fellow ECE students in the building campaign. According to SAC co-chair Jeff Lale, they chose to divide themselves between EE and CompE to “leverage the existing rivalry between the majors to create a heated and competitive coin war.” The two teams competed to see which side could raise the most money from April 12 to May 1, playfully claiming their major’s superiority whenever the balance shifted in their favor. The competition culminated with SAC’s May 1 social, where a close rivalry bred excitement and further donations. The competition’s “balance tilted either way quite a few times before finally settling down to the EEs,” said Nikita Parikh, SAC’s Student Advancement Lead. “I distinctly remember hearing a lot of oohs and aahs as the people at the social responded to the changing amount of money in the EE and CompE jars.” At the end of the campaign, the students had raised a total of $680. Nikita articulated that the alumni contributions are what will make the building possible, and part of SAC’s goal with the Coin Wars was to increase awareness of continued alumni support and donations. Lale noted that “a single student’s contribution can’t reach anywhere near the generosity of ECE alumni or corporate donors,” but he sees great importance in student involvement with the building campaign. “Incorporating students in the fundraising process through the coin wars helped make students more aware of the enormity of the building’s overall fundraising effort and the tremendous generosity of our alumni.” Alumni and corporate donations are what will provide the department, faculty, and students with the resources they need to persevere as leaders in the field. View the Coin Wars photo gallery to share in the excitement of students, faculty, and staff for the new building!